CAD MicroSolutions Inc. will be hosting a live Webinar on Wednesday 6th February at 11:00am – 12:00pm EST covering Design Configuration & Automation with DriveWorks. Our Vice President & Co-Founder of DriveWorks, Maria Sarkar will be joining the webinar to share how manufacturing companies around the world are using DriveWorks to automate their design process and grow their business by selling custom products. The webinar will be discussing the growth in personalization/custom products and showing the benefits of DriveWorks when used as a Design Automation and CPQ (Configure, Price, Quote) solution. Register today to learn more about the automation software that saves time, enhances product quality, reduces cost of custom designs and gives faster response to customer enquiries. The webinar will take place at on Wednesday 6th February at 11am EST. 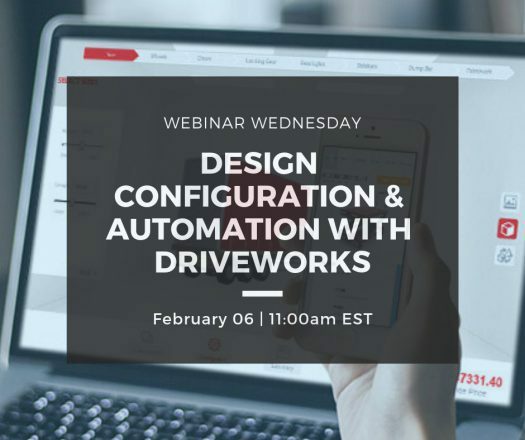 Sign up to join the webinar and learn more about Design Configuration & Automation with DriveWorks.